Gold long Armour styled body chain with fringe detail also available in Silver. Gold crop top style body chain. Black velvet choker with a rhinestone statement pendant. Jewel encrusted choker detail waterfall shoulder body chain. Gold body chain samba style dress also available in Silver. Luxury drop choker detail necklace with diamante detail. Luxury rhinestone calf chain jewellery with toe ring detail. Pink cut out bikini with blue trim detail. Cut out long sleeve white and ankarah print swimsuit. 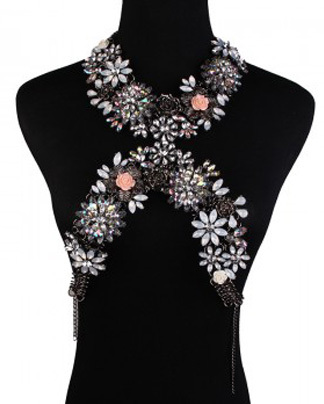 Heavy flower detailed crossover multi-jeweled body chain.